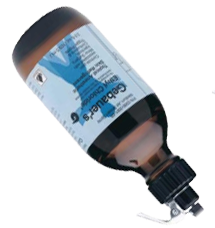 Ethyl chloride is a prescription medication that we use as a topical skin refrigerant to reduce head and neck muscle pain. It is a liquid but once it hits the skin, it evaporates. What is wonderful about the medication is that it can greatly reduce head and neck muscle pain for several hours even though it is applied topically. Spray in the direction of the arrows starting with the shoulder, followed by the neck, then the jaw and ending in the temples. The pattern for the shoulder, neck and jaw are the same for each of the four sprays per side but since the temporalis muscle (temple area) is shaped like a fan, you want to spray the entire muscle so follow the arrows in the image to the right. 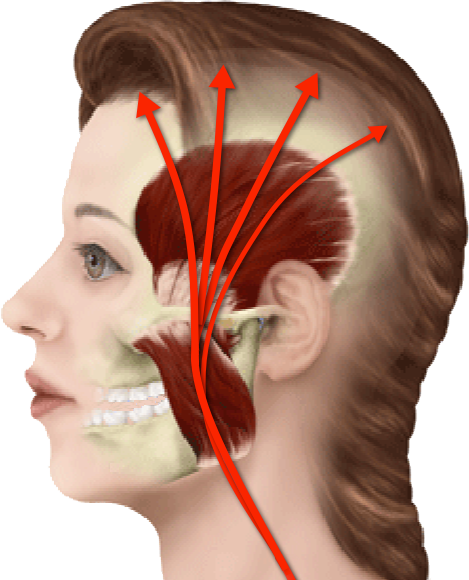 It does not matter if you spray the front of the temporalis muscle first or the back part first (above the ear). The point is that you want to get all of the fibers of the muscle. For people who are not experienced using the spray, we suggest placing a cotton roll in the ear, and a hand over the eye so that the medication does not get into the ear or the eye. After spraying, you can warm the skin with your hand, and then stretch the jaw for 6 seconds, relax, and repeat that five more times.